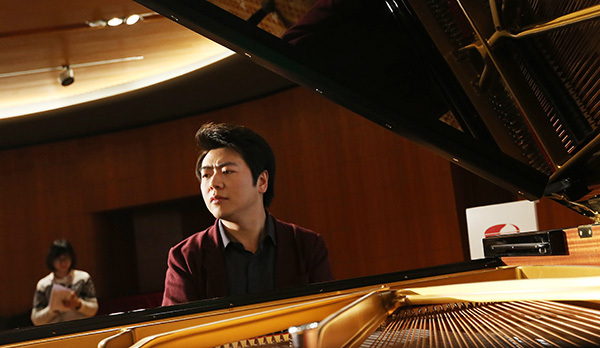 Chinese pianist Lang Lang will hold a benefit gala dinner in New York on Wednesday to raise fund for music education. The Lang Lang International Music Foundation (LLIMF) is celebrating its 10th Anniversary with the gala at Cipriani 25 Broadway in Lower Manhattan Wednesday evening. The World-renowned pianist will lead a performance featuring the foundation's Young Scholars during the event. The evening will also feature Golden Globe-winning actor Alec Baldwin as the host, as well as internationally acclaimed tenor Roberto Alagna, twelve-time Grammy Award Nominee Ledisi, and three-time Grammy Award winner Wyclef Jean. Founded in 2008 by Lang Lang, the LLIMF strives to educate, inspire, and motivate the next generation of music lovers and performers. It has successfully developed music education programs benefiting children across the world including Keys of Inspiration (KOI), 101 Pianists, Young Scholars and Play It Forward within ten years. "At LLIMF, we believe that all children should have access to music education, regardless of their background." Lang Lang said. "Most students enter the program with no prior knowledge of music or piano. There have been many students who began the program speaking no English, but in the KOI classroom, everyone speaks one language: music." As of September 2018, it will have 40 schools enrolled in the program from across the United States, reaching over 6,000 students. Utilizing a strategic expansion plan, KOI will reach 30,000 students in 80 schools by 2020, said Leszek Barwinski-Brown, the Chief Executive Officer of LLIMF. The Young Scholars is designed to identify and support extraordinarily talented young pianists in their professional and social development. Every two years, LLIMF welcomes a new class of Young Scholars. The students are selected by Lang Lang and his teacher Gary Graffman from hundreds of applicants, and receive mentorship, tutelage, and unique performance opportunities. They participate yearly in Oxford Summer Paino Academy, Music Fest in Perugia, Leeds International Piano Festival, Summer Music Academy at Eurpean Culture Center in Poland and Summer Music Summit in Chicago.